DBF – Going Back (Quextal remix) released! 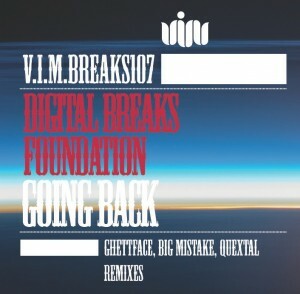 My “remix” of Digital Breaks Foundation’s “Going Back”, my first released tune, comes out on VIM records today (VIMBREAKS107). And here’s where you buy it on Beatport. It’s been a long road getting this out of the door… manifest thanks to everyone who helped it into the world, especially Greg (VIM) for signing me up in the first place, Adam (Re:Creation) for the great mastering, John Snook for the session at his when I was stuck without monitors, Deirdre and Mike for important moral support, and everyone else who provided feedback and encouragement.